I Love the Mountains by Countdown Kids (100 Silly Songs) – I Love the Mountains is a song I loved to sing with my Kindergarteners and Grade 1s. We used to sing it in a round and the kids loved it! R totally enjoys this song as well. In fact, she rocks back and forth as it plays and tries to sing along! Like with most songs, I like to add actions to them so that R’s learning experience includes activation of a number of areas of the brain so that the learning is more meaningful and memorable. I pulled out my old Let’s Go Fishing game that is battery operated. When turned on, the mouths of the fish open and close and the goal is to get the fishing poll in the fish’s mouth to get it out of the “pond”. It sounds easy enough, but it’s pretty tricky! R had a tough time using the pole to get the fish out, so she often resorted to using her hands. I used the colours of the fish to guide her to picking out certain fish. I would say a colour, then point to a fish that was that colour and then she would scoop it out either with the pole or her hands. Since the fish are small, I wouldn’t put this out for independent play until she fully stops putting things into her mouth. a. 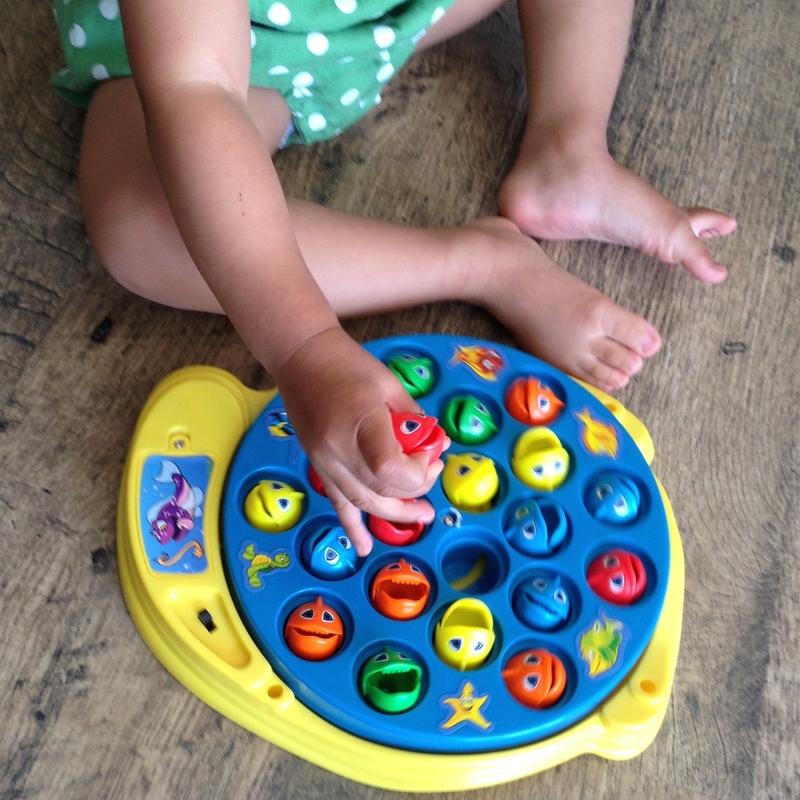 Ask the child to name the colour of the fish as s/he fishes it out. b. Work on positional words with the child. Ask him/her to get fish from the “middle” or “outside” of the pond. I also made a magnetic fishing game for R to play outside. I made a pond with blue construction paper. I attached 6 pieces together using double sided tape and then cut out a pond like shape. I used the Cricut machine (I just love that thing!!!) to cut out some fish of different sizes and added magnetic tape to the backs of them. I then attached a BBQ skewer to one end of a piece of string using tape and added a fridge magnet to the other end of the string. We practiced the words “big” and “small” as I guided her to catch the appropriate sized fish. a. 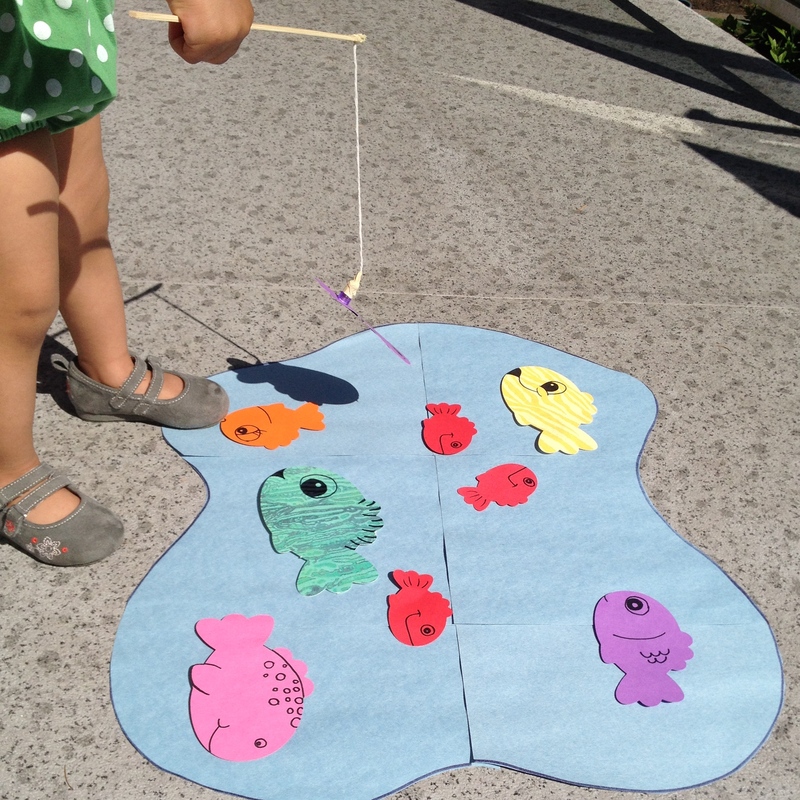 Have the child draw and cut out his/her own fish for the fishing pond. It’s always more fun when s/he does it him/herself! b. Use comparison words with the child and encourage him/her to do the same. For example, you can say, catch a fish that is smaller (bigger) than the fish you just caught. Or, find the smallest (biggest) fish in the pond and catch it. 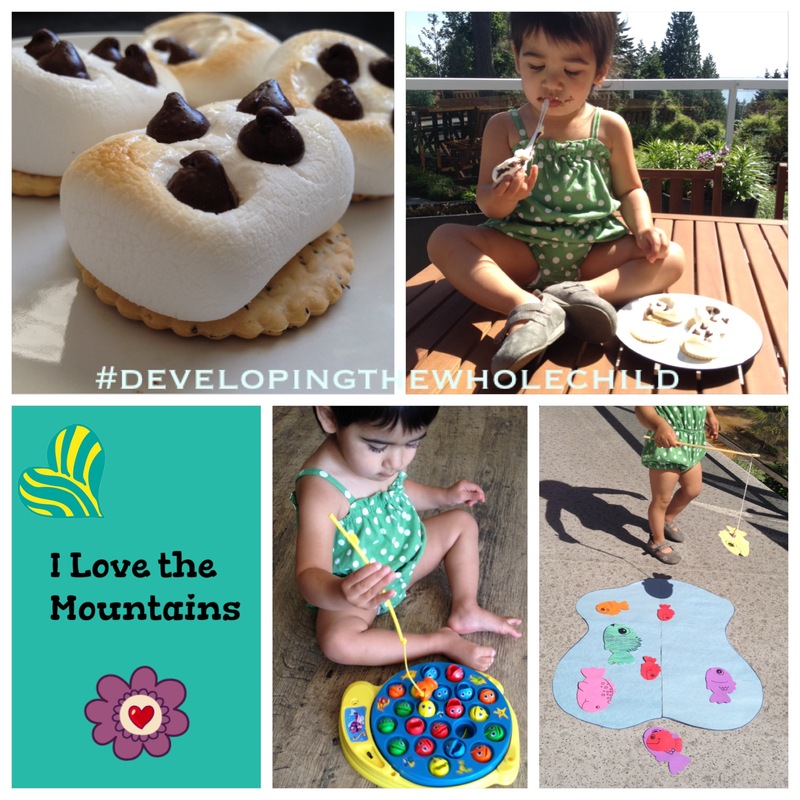 I toasted up some s’mores in the toaster oven for R and I to eat during her snack time. I topped a graham cracker (a sweetened wheat cracker) with a marshmallow and chocolate chips. The marshmallow get big and toasty in just a few minutes, so do leave it for too long! I let the s’mores sit out for a while because the chocolate and inside of the marshmallows get really really hot!!! 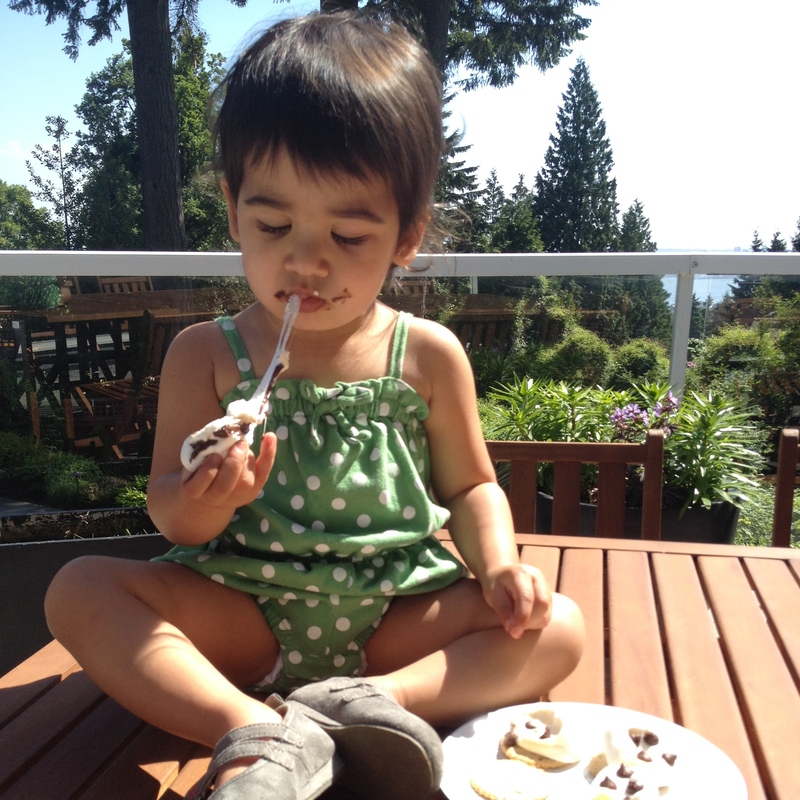 I plopped R on our patio table, or “picnic bench” and we munched the s’mores together. She loved making the marshmallow stretch out and made a big old mess of her hands!